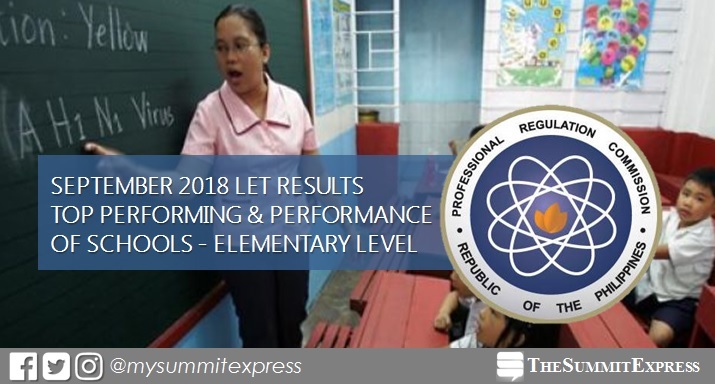 MANILA, Philippines – The Professional Regulation Commission (PRC) hailed the top performing schools in the September 2018 Licensure Exam for Teachers (LET) also known as Teachers board exam for Elementary level. The results are released on Friday, December 7 or in 47 working days after the exam. PRC conducted the second LET board exam this year on Sunday, September 30, 2018 in at least 25 testing centers in the country. In the same period last year, University of Santo Tomas (UST) topped the schools for LET - Elementary level with 93.81% or 106 out of 113 passed the exams. Polytechnic University of the Philippines (PUP) - Manila ranked second with 93.51% or 72 out of 77 successfully hurdled the tests. PRC also named UST as the top performing school in the September 2016 exams, 97.79% or 133 out of 136 passed the exams. It was followed by Bohol Island State University (BISU) with 91.89% or 68 out of 74 passed. In the September 2015 exams, UST also dominated the schools with 96.21% (127 out of 132). Philippine Normal University (PNU) - Manila ranked second with 95.16% or 177 out of 186 passed. Monitor this page for the real-time updates on LET board exam results. Check out also the official website of PRC for more information.